The Woady Yaloak Catchment Group’s “alternative fertilisers and biological products for pastures and crops” trial is one of the most interesting but also complicated to be undertaken in recent years. It can be described as “the trial from hell” because it had such an ambitious agenda which ended up being curtailed by funding constraints, that drawing useful on-farm strategy conclusions about some of the products is difficult. 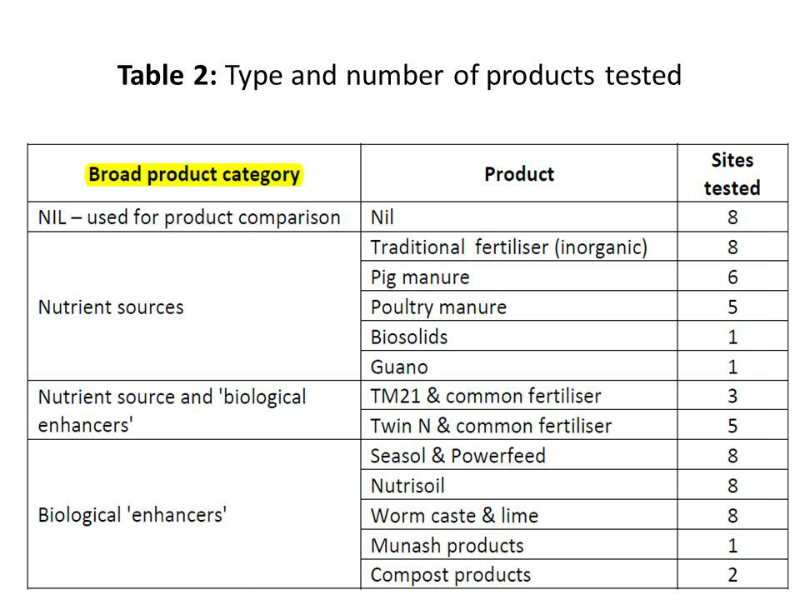 The methodology was compromised by having too many trial sites with different farming and fertiliser histories; adding products with vastly different nutrient compositions then allowing product retailers control application rates used, and not retesting all the sites at the end of the trial. This is in stark contrast with the Holbrook trial where comparisons were made on the one site with a known history. In common with the other ‘alternatives’ trials it seems the organizing committee of local farmers didn’t seem to have a scientific basis for running the trial. Their reasoning was that alternatives to conventional inorganic fertilisers are being promoted to farmers so is it possible that some may produce higher livestock production or crop yields at a lower cost per hectare? There was no indication that the committee looked at typical farming systems to identify any significant shortcomings which an alternative product may help to rectify. In other words, what aspects of soil health, if any, on typically managed farms could be improved by using alternative fertilisers or biological products? The committee fell into the trap of having the trial methodology dictated by product suppliers. It might have been done intentionally so the companies “cut their own throats” if a product didn’t perform but it is not scientific and makes meaningful comparisons impossible. Eight sites were identified by farmers in the Woady Yaloak catchment, table 1, which represented a range of typical pastures and crop rotations. All sites were soil tested before the trial commenced. This included a traditional soil test, as well as a test to measure biological activity in the soil. Twelve products were tested, some at multiple sites, some at only one or two sites, table 2. The choice of product to test at any site was determined by local farmer interest. Table 2 also highlights the important differences between the function of the different products. But even then it could be argued that some products are in the wrong category. For instance pig and poultry manures are more than nutrient sources, they are adding large quantities of organic matter and microorganisms so they have a biological and soil structure enhancing role as well. The confusing aspect of the trial which undermines its usefulness is the wide variation in the number of products tested at each site. As table 2 shows five products were tested at eight sites, one product was tested at six sites, two products were tested at five sites, one product was tested at three sites, one product at two sites, and three products at one site. So for at least four products the results do not have site replicates and maybe confounded by single site effects. Seasonal conditions for the trial were highly variable, 2009 was dry with a poor spring, 2010 was above average rainfall, and 2011 was close to average rainfall. The key commercial measurements taken were dry matter production and grain yields. But it was the soil analyses that while being hard to compare did provide some interesting anecdotal information about soil food web biological changes and soil carbon enhancement using glomalin as the indicator of carbon – a possible first in Australia. Farmers interest in, and understanding of soil biology and the soil food web has made significant gains since 1999 when biologists like Dr Elaine Ingham, Dr Christine Jones and Dr Jill Clapperton started running workshops on the topic. There has been a corresponding commercial products explosion of biological related products, some are biological brews while others claim to support or enhance existing biological food web activity. The great difficulty most farmers have with understanding the biological status of soils in the paddocks is that they have no benchmarks for where they should be, or in other words at satisfactory levels, given the management and enterprise practiced. Product suppliers don’t help because they usually recommend multiple applications per year with no reference to benchmarks. It could be the paddock in question already has a healthy soil food web and any product additions will make no difference. In fact, some soil biologists argue that in most well managed, carbon rich soils the natural soil food web is so prolific and dominant that any foreign microorganisms added are simply overwhelmed. This is particularly the case in pastures soils. The other problem for farmers considering applying products is that the cost of testing for biological benchmarks is far more expensive than conventional soil nutrient tests. In this trial all eight sites were tested for biological activity by the Soil Foodweb Institute (SFI) laboratory. This is a particularly helpful biology analysis as the Institute does provide some across enterprise benchmark figures for different components of the food web. All sites were considered to have deficiencies in total and active fungi and bacteria and with their balance. Levels of protozoa and nematodes were inadequate. 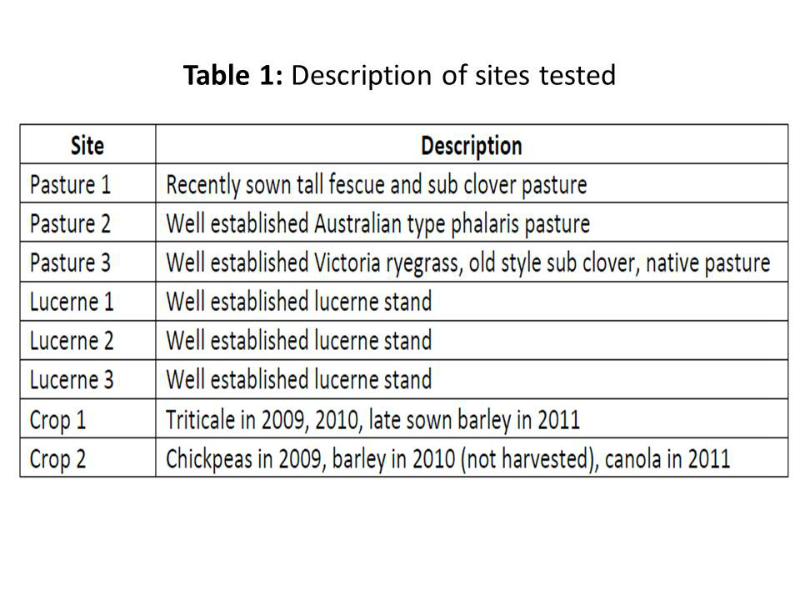 A comparative biological activity test was conducted in 2011 on one crop, one pasture and one lucerne site at the completion of the trial. At the pasture site in the control (no treatment) plots the total microbial population and diversity had improved close to SFI benchmark levels. 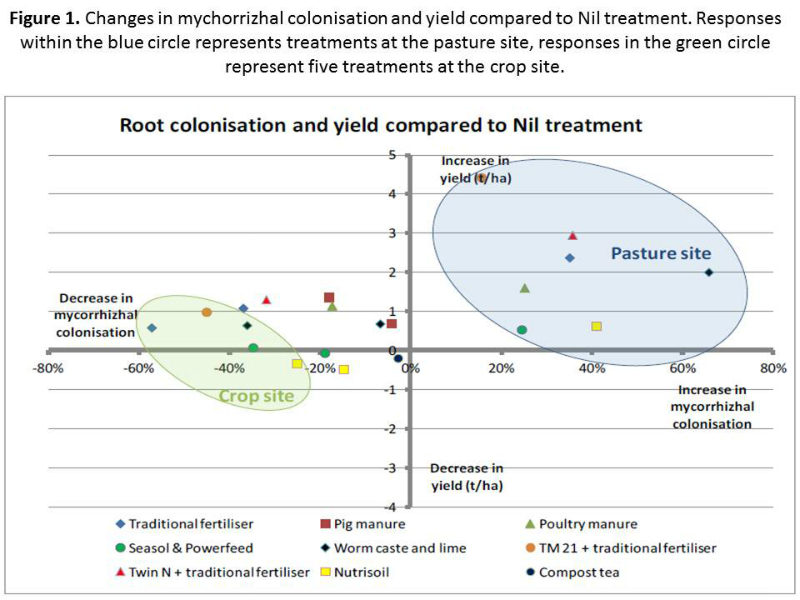 But three biological treatments along with traditional fertiliser alone had slightly lower total microbial populations than the nil treatment. Strangely on the pasture site, the pig manure treatment had a major decline in total microbial population. No products increased total microbial populations at the pasture site. There were some positive impacts of biological products at the crop site. Total microbial levels on the control treatment were less than the 60% of the guide level. The worm caste treatment had an even lower level. Substantial increases were measured under the Seasol and Powerfeed, compost tea and pig manure. This is not surprising for cropping soils as depending on previous intensity of cropping, method used either no-till versus tillage, rotations and stubble management, soil carbon/organic matter which is the food webs food source are usually significantly reduced, and so are their populations. Microbial diversity only improved with treatments on the pasture site with greatest change taking place in protozoa population. The only treatment not increasing diversity was traditional fertiliser. When pasture yield and microbial diversity is analysed across the treatments, it is the products that contain nutrients rather than those that adding biology which have a positive impact. This suggests that boosting carbon flows in the system has the knock-on effects of boosting microbial populations. Another interesting component of this trial was its analysis of mycorrhizal colonization of plant roots at all sites. All treatments increased colonization at the pasture site to close to recommended levels (above 30% roots colonized). 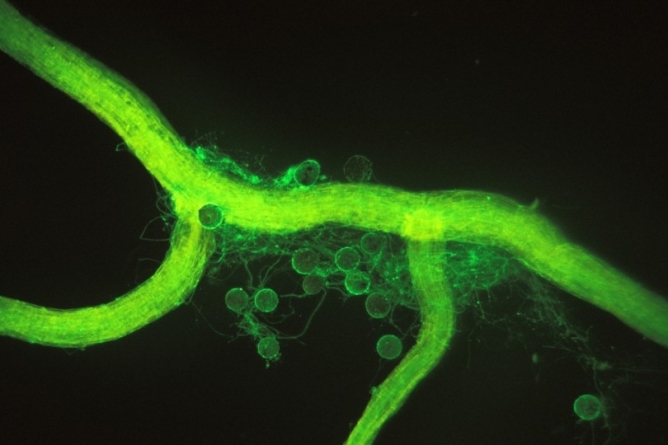 Soil biologists claim that phosphate fertilisers reduce mycorrhizal colonization, and soils with low available P have higher colonization as that is the situation which encourages the fungi. This was not demonstrated on the pasture sites in this trial. On the crop site most treatments reduced colonization, figure 1. There was no correlation between the amount of mycorrhizal colonization and pasture dry matter production or crop yield. This characteristic had enormous variation between sites and suggests local effects have much greater impact on mycorrhizal colonization than the products applied. The most intriguing analysis undertaken in this trial was the measurement of soil glomalin levels. I have never seen this done in Australia before. Glomalin is produced in cell walls of mycorrhizae fungi. It was only discovered in 1996 by a USDA researcher Sara Wright (see article in Soil health section of this web site). Why glomalin, which in one study was shown to account for 27% of the carbon in soil, was considered a more useful measure of soil carbon than Total Organic Carbon (W&B method – measure approximately 80% of carbon and Leco method – 100% of carbon, are tests most commonly used) is not explained in the final report. Glomalin is a recalcitrant carbon compound which adds to the total organic carbon pool. How much it adds is difficult to ascertain as research papers about it are difficult to find. Even so early estimates give its lifespan between 7 and 42 years. 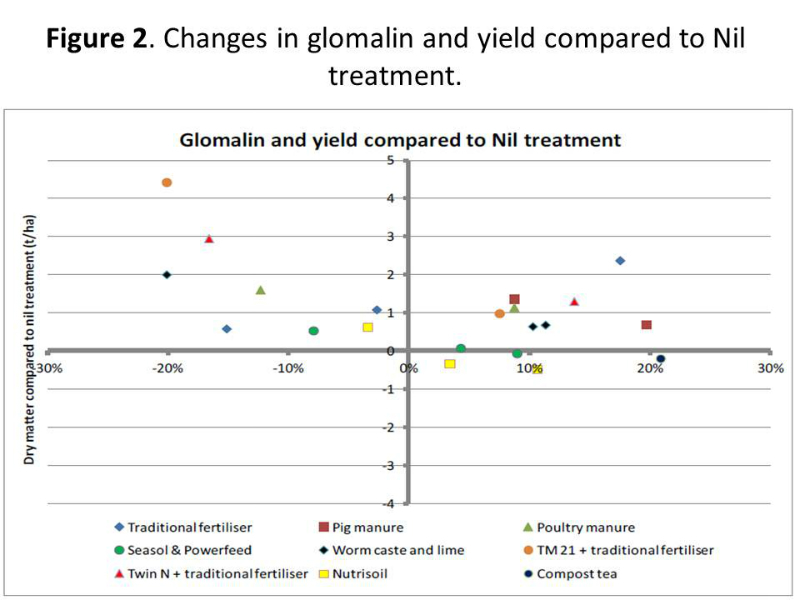 The amount of glomalin present could be expected to be correlated with mycorrhizal colonization percentage, particularly in perennial pasture where fungi life is less likely to be interrupted compared to crop paddocks which have many months of no live roots present. I could not see any correlations between these two characteristics across all the products compared with nil treatments, but that is not unexpected given the short duration of the trial. A significant change in soil glomalin level would be expected to take decades rather than years and assumes the 2008 glomalin level is below the benchmark for the soil and plants growing in it. The lack of correlation between these two characteristics is likely to reflect sampling error associated with mycorrhizal colonization and glomalin level. The committee conducted the conventional W&B soil organic carbon test which estimates labile carbon present and the total organic carbon test for all sites at the start and end of the trial. After three years there was no “… clear evidence that treatments having a consistent effect on soil organic carbon or active (labile) carbon.” As has been shown in other research, more favourable growing seasons which result in more plant and root growth as happened in 2010 and 2011 will boost soil labile carbon content – this happened at all three nil treatment sites. These biological and soil carbon results demonstrate that any paddock’s soil biological status is a highly complex ecosystem which is not consistently altered by additions of microorganisms or substances that support them. It suggests farmers need far more precise tools to diagnose a paddock’s biological status and accurate and relevant benchmarks for the particular soil type and enterprise to compare them to. Importantly farmers need to identify a problem rather than apply products in the hope that a possible problem is solved. This is the basis on which nutrient fertilisers, be they organic or inorganic , should be applied (but commonly are simply applied as a routine) and it should be no different with biological products. 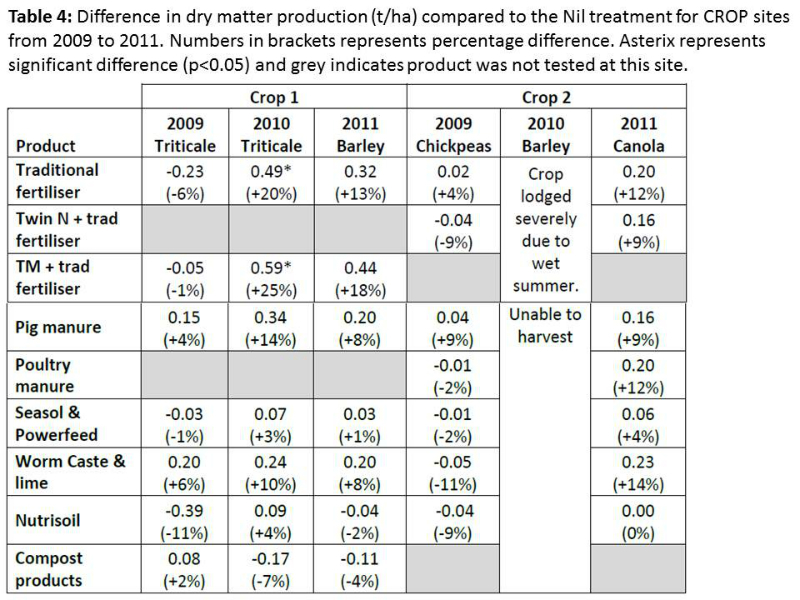 This trial only confirms one issue which is already well known, that is cropped soils tend to have lower soil carbon levels and biologicial status. Improving both characteristics can be done and will be necessary to maintain profitable long-term yields. However, the improvement needs to be undertaken in conjunction with maintaining nutrient status to prevent mining the soil and in conjunction with maintaining the soil physical characteristics. At the same time I disagree that trial was scientifically robust enough to conclude that “…there is no evidence to suggest the biologlical approach is ‘unlocking’ locked up nutrients” and “…that improving soil biology will necessarily lead to improved plant production”. It is bizarre that after drawing these conclusions the report concedes that “…the results and indicators used could lead to an incorrect conclusion. Interpretation (of the results) must be viewed with a great deal of caution”. 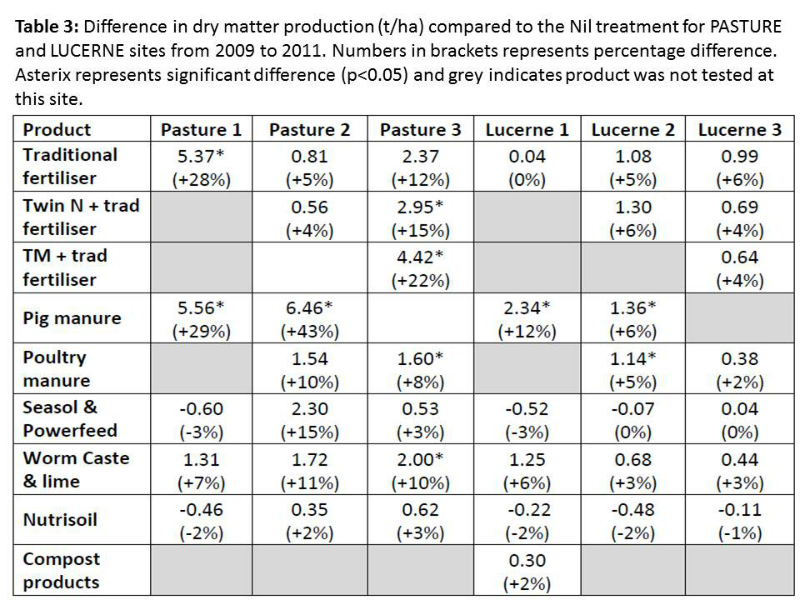 The overall pasture, lucerne and crop dry matter yield for each product compared to nil treatment is shown in Tables 3 and 4. 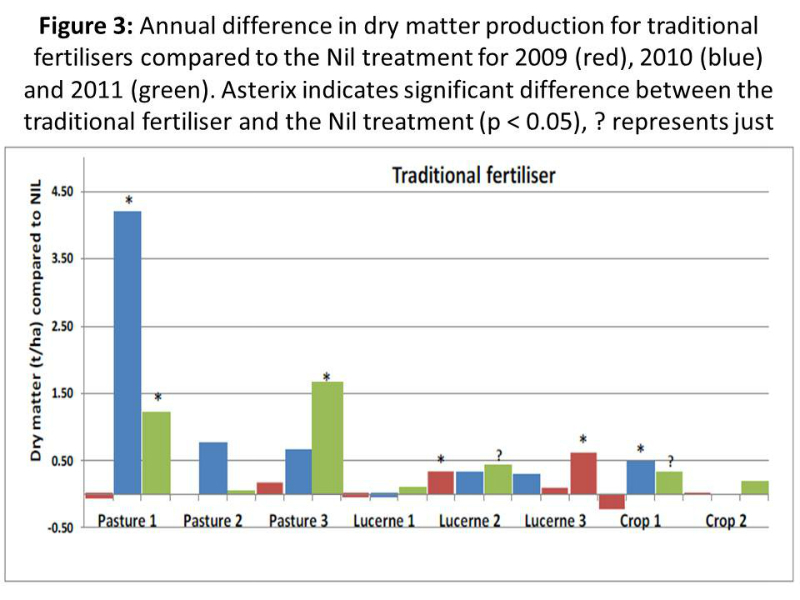 Given traditional fertilisers were applied at all sites to achieve target soil nutrient levels and dry matter yield responses compared to the control (nil treatment) they provide results most farmers can readily relate with. What is particularly interesting is the comparison of input cost versus yield improvements on the pasture and lucerne sites. 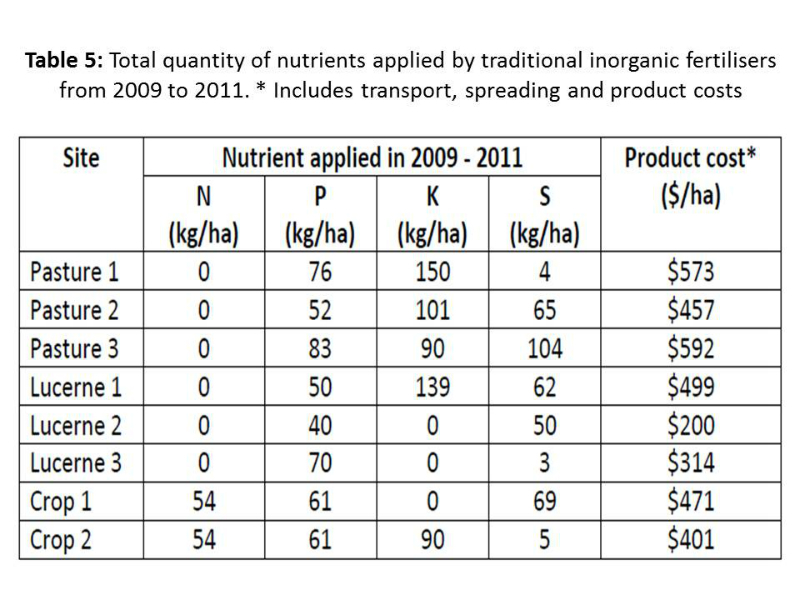 Table 5 shows the quantity of nutrients applied and total product cost over the three years. Figure 3 shows the responses above the nil plots. Except for the pasture 1 site which had a 60% increase in dry matter in the second year, the cost benefit of applying fertilisers to achieve the target soil nutrient levels must be questioned. For pasture 2 site $457 per ha was spent to produce an extra 0.6tonne per ha of dry matter over three years. On lucerne 1 site $499 per ha was spent to produce an extra 0.5t dry matter per ha. While the return on investment was shaky for the traditional fertilisers, this trial showed it was even worse for some of the biological products. The Twin N plus traditional fertiliser cost $652/ha on pasture 2 site while yield improvement was barely positive over three years. The biostimulant TM on pasture 3 site cost $674/ha and boosted yield by 2 t/ha for the two wetter years. 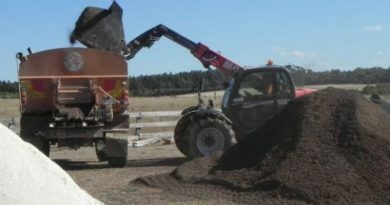 Pig manure which provides nutrients as well as carbon rich organic matter produced a major boost of close to 4.5t/ha to pasture yields in the second year at the two sites it was applied. It’s cost was $246 per ha which is a reasonable return on investment. It’s responses on lucerne were much more moderate at around 0.5t/ha each year. Interestingly poultry manure responses were limited to around 0.5t/ha but the cost involved was far less than for pig manure at $150 per ha. For input cost the most expensive was “worm caste and lime” at $930 over the three years. Useful dry matter increases in pasture happened only in year 2 and may have been due to the lime effect rather than worm castes as soil pH improved. For Guano, Biosolids, Composts and compost teas, Seasol & Powerfeed, Nutrisoil, and Munash, dry matter responses in pastures or crops were not demonstrated in this trial. 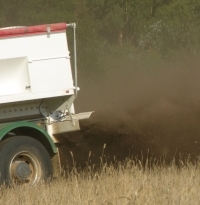 This alternative fertiliser and biological products trial clearly demonstrates that farmers need to make fertiliser decisions based on scientifically measured characteristics undertaken over time (years) rather than on a prescription or ideology. Had an economic analysis been undertaken of the cost benefit ratio of all the treatments in this trial it’s likely that nil treatment on the plots involved would be the winner, at least in the short term. The biological and carbon data presented highlight how complex soils are in this regard and that the overriding influence on these two factors is seasonal rainfall. There is a distinct difference in making decisions about biological fertilisers and products associated with cropping soils and pasture soils, especially if there has been a long history of cropping which gradually depletes soil organic carbon the food source for the soil food web. 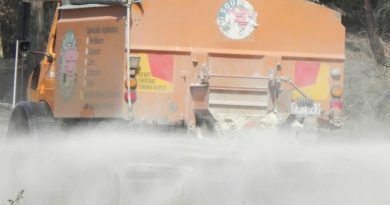 For inorganic chemical fertilisers the data presented highlights the financial danger of making application decisions based on target levels alone. For pastures and lucerne there are other strategies available to help achieve the level of productivity required. For crops, total soil carbon, sap testing, yield monitoring and nutrient balances are likely to be the best indicators to rely on.